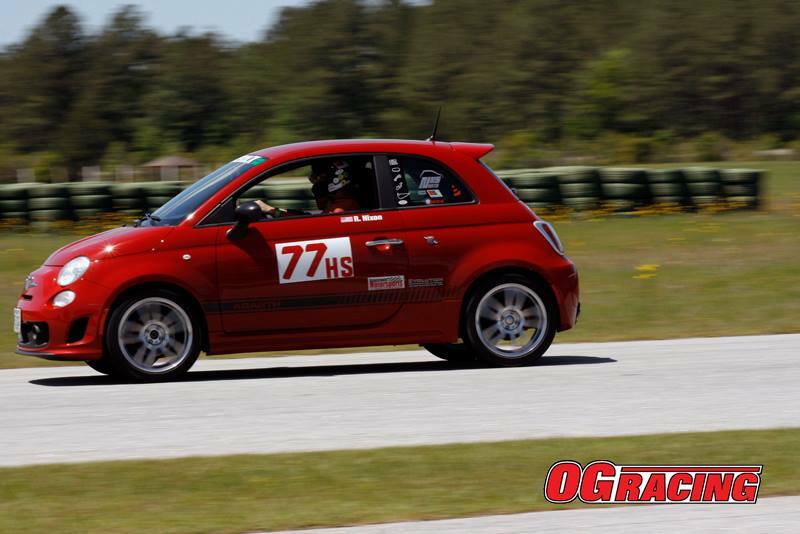 I don't know about you, but I had a GREAT weekend driving the Abarth on a track! Carolina Motorsports Park (CMP) in South Carolina is a great little 14 turn track, mostly flat, and we were able to camp out for the weekend (other than some rain during Saturday night and surprisingly chilly evenings for May.) The day time weather was great though, and over 9 driving sessions on track and 5 classrooms sessions, I learned a lot about driving! The National Auto Sport Association (NASA) folks put on a very professional and well-organized event, so if you're looking to get on track, I highly recommend you go with them. On Saturday we started with a meeting for all drivers, and then we all split our different ways depending on what group we were in. NASA has 4 levels of high performance driver education (HPDE) starting with beginners like me in HPDE 1, and then moving up (when an instructor says you are ready) thru HPDE 2, 3, and then 4. The good thing about this system is that you will be on track with drivers of similar abilities, so that keeps things on the safe side. They have specific rules for passing other cars, depending on which HPDE group is running, so again, this makes things safer. During the last session on Sunday, we had our HPDE group combined with HPDE 2, so I was on track with Zack and Brian at the same time! That was even more fun, since Brian shot a video which enabled me to see my driving from a different point of view also. Lots and lots of fun, you should check out getting on track. 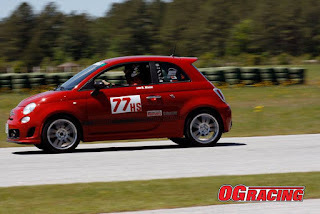 Bottom line, I learned a lot by riding with a pro instructor, the FIAT 500 Abarth held up great, brand new higher performance EBC Yellowstuff brakes were great, I managed to put some wear on the Bridgestone tires, we camped out and had a great time, and the NASA folks put on a great event. You can find a link to NASA on our NMS page.